Narcisse Diaz de la Peña was a French landscape and figure painter and founding member of the avant-garde Barbizon school. Born in Bordeaux in 1807 to Spanish parents (refugees from Joseph Bonaparte's Spain); he was orphaned by the age of 10, left penniless and in the care of a priest at Bellevue near Paris. The young Narcisse, who due to an unfortunate accident lost one of his legs to blood poisoning, became famous with his “wooden stump” and apprenticed at the studios at Sevres by the age of 15 -- where he painted porcelain. The hard work soon took its toll on Diaz and he began to paint his own compositions, mostly of rich, oriental subjects. As was a common practice during the period, Narcisse learned to paint by studying the masters at the Louvre, where he was drawn to the works of the colorists. Early inspiration came most notably from Correggio, whose Antiope he repeated and interpreted in his own Nymphe Endormie (in The Louvre), and in the two sketches in the Wallace Collection, Venus désarmant l'Amour and L'Education de l'Amour. He was also influenced by Prud'hon whose Venus and Adonis (in the Wallace Collection) inspired a work by Narcisse of the same title (now in The Louvre). In his paintings, intended for a certain caste of the Second Empire, Narcisse also borrowed from the 18th-century painters of the fêtes-galantes. Narcisse's Le Clown (in The Phoenix Art Museum) is composed of bits and pieces from Watteau's Gilles (in The Louvre) and from several other works by Watteau. His La Fée aux Perles (in The Louvre) borrows heavily from the Vénus de Milo. Among his contemporaries, Narcisse had two great influences: Eugène Delacroix with his Orientalist nymphs, Turks and Bohemians, and Théodore Rousseau, with whom he became friends at Barbizon in 1836 and who gave him a taste for the Dutch masters. Narcisse first exhibited at the Salon between 1831 and 1837. From 1837 to 1844, he was an important and influential member of the Barbizon school. During the following years, he was awarded three Salon gold medals for painting, and, in 1851, was named a Knight of the Legion of Honor. With the Salon of 1848, the Barbizon School of painters became a definite, recognized movement, dominating French landscape painting through the late 1860's. Prior to the nineteenth century, artists drew but rarely painted en plain air. 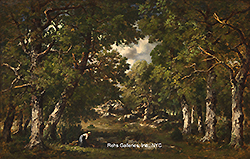 By the middle of the century, the painting of small outdoor studies was common to Corot and the Barbizon school. At Barbizon, Rousseau, Diaz and their friends had rediscovered nature together with Corot and Daubigny. Although the individual methods and concepts of the Barbizon painters differed considerably, they had in common a complete devotion to nature and a desire to be faithful to their observations.Diaz specialized in somber woodland interiors in which spots of light or strips of sky shining through the branches would create dramatic contrasts. A fanatic adversary of line as well as of the slick academic technique, he loved color and the rough texture of heavily-applied paint. Art historians have attempted to confine Narcisse to a single school - Barbizon – but Narcisse was a free spirit and followed his own instincts. In 1851, Diaz built his own studio in Paris, and there he became sociable and entertaining for several years. By the 1870’s, his works became the fashion and increased in value from year to year. Diaz married and had two sons, Emile, who showed some artistic talent, and Eugene, who became a musician. He lived in prosperity and honor, dying in Mentone in November of 1876. Collections of Diaz de la Peña's paintings are in The Louvre, The Reims Museum, and The Metropolitan Museum of Art in New York (which has among many others, A Clearing in the Forest of Fontainebleau). His Courtesans and Descent of the Bohemians are at the Museum of Fine Arts, Boston, and his Valley Marsh is in the Cincinnati Art Museum. There is a significant collection in Paris (32 at the Louvre), in London (four at the National Gallery, four at the Victoria and Albert Museum, and three in the Wallace Collection), and at The Hague (eight at the Mesdag Museum).